QRSS and QRPp is an excellent combination. The reduction in speed, can be translated directly into a reduction in power. So if you are bored with 1 watt, then try this simple attenuator, which is built with good available E12-series resistors. The input power of the attenuator is 1 watt, if the maximum power dissipation of each resistor is 1/2 watt. This attenuator can be used to WSPR with very low power. With the FT-817 on 1 watt, the power is reduced to 10 mW. And with 500 mW the power of the FT-817 is reduced to 5 mW. The difference between 10 mW and 5 mW will not be noticed, except if you look carefully at the remote S-meter of the receiving WSPR station. But notice that the attenuator is also giving 20 dB attenuation while receiving. The ARRL International DX contest is a very nice contest for DX QRP stations. The receiving station can also apply for this Award that is issued by QRP ARCI. Click for info on the "1000 Miles per Watt Award"
I often try to use the lowest possible power in each contest QSO, so when possible, I try to use a power of 2.5 watts or lower. All DX stations give their estimated power. I give a report 599 3 when I use 2.5 watts and 599 1, when I use 1 watt or 500 milliwatts. The report 599 1 can be confusing to station that only have met DX stations with a power of 100 watts to 1 kW. Wat een contest. Dit is écht bijzonder. Veel activiteit uit Zuid Amerika, maar toch een echte DX contest. Ik heb al een aantal QSO's gemaakt met Brazilie met 2,5 watt. Dus meer dan 1000 MPW. En zelfs een QRP station uit PY gewerkt, dus 2 way QRP. hi. Verder nog 3 andere continenten. Ik ga snel weer door in de contest. This is a very special contest. The contest is organized by the group CWJF from Brazil. There is a lot of activity from Brazil, but it's really a DX contest. I worked SA, AS, NA, EU. QRP stations are recognizable from their exchange. Just worked K3WW with it's Excellent Ears on 20 mtr with just 1 watt. Just made a QSO with EN50UG on 20 meter with 5 watts. 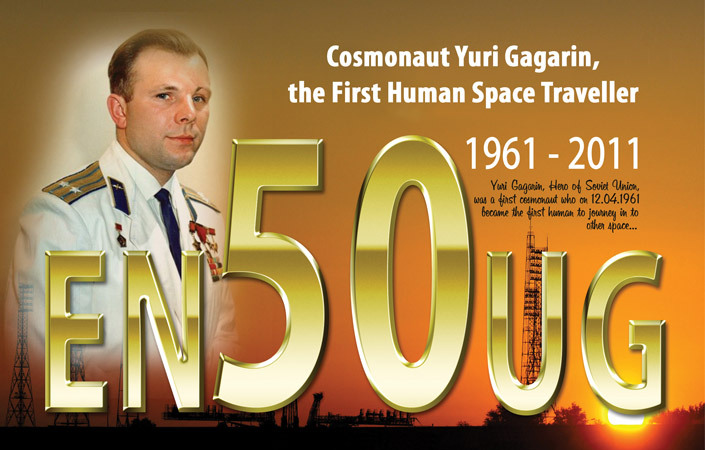 This is a Special Event Callsign of Gennady UX5UO to commemorate to first manned spaceflight 50 years ago. Yuri Gagarin - Ю́рий Алексе́евич Гага́рин - made the historic flight on the 12th of April 1961 in his spacecraft Vostok. At the end of his flight of 1 hour and 48 minutes, he ejected from the craft and landed by parachutte. Now wait for the beautiful QSL card, that can be seen on QRZ. By using just 450 mW we "breached" the 1000 Miles per Watt boundary. 450 mW and 580 miles to Ostrava gives about 1300 miles per watt. It is great to see that this sort of propagation is possible. Later that day I made a second "1000 MPW" QSO with UR5LAM. Yesterday I made additions and changes to the Power Attenuator Calculator. This spreadsheet, can be used to design Power Attenuators. With this excellent Power Attenuator Calculator you can design attenuators of 3 dB, 10 dB or 20 dB, for any Input Power you want, which are built with good available resistors of the E12-series, with a maximum power that you can chose yourself. I use attenuators for QSO's with very low power. A 10 dB attenuator reduces the 500 mW from my FT-817 to 50 mW. The new Calculator will show up later on the PA1B QRPp page, but via the Public link to Dropbox Power Attenuator Calculator you can download the calculator in advance. Take a look and get your self a shopping list for an attenuator.